This patch changes icons of accommodation and food group to SVG icons taken from two GitHub repos: gravitystorm/openstreetmap-carto and nebulon42/osmic. Goal is to standardize icons across OSM, if it will be accepted, I will continue with other icons. new-icons-food-and-accommodation.patch​ (10.9 KB) - added by Yarl 4 years ago. accommodation.zip​ (20.0 KB) - added by Yarl 4 years ago. food.zip​ (14.4 KB) - added by Yarl 4 years ago. iconcomp.png​ (276.9 KB) - added by Klumbumbus 4 years ago. carto.png​ (14.5 KB) - added by Klumbumbus 4 years ago. acc.png​ (3.1 KB) - added by Klumbumbus 4 years ago. osmic-josm-shields.zip​ (108.1 KB) - added by nebulon42@… 4 years ago. Zip files contains directories from path images/styles/standard. Some files were added, old ones removed. Whats the license of these icon? Are they identifiable at a size of 16px? Both source repos are on CC0. Icons looks OK for me, exactly like on osm.org. @team: any general comments to the unification of the icons with the mapnik style? 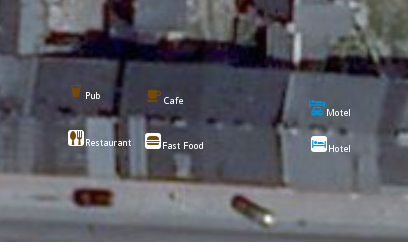 I like the suggested icons for accommodation, but would prefer the current JOSM icons for cafe, fast food, pub and biergarten. A map is not the same as an editor, so different design goal leads to different icon sets. Colorful icons make sense for JOSM as they are easier to recognize. On a map, you have to care about overall aesthetic look. Sounds reasonable. Some mapnik icons do not work anyway for JOSM like highway=traffic_signals, barrier=gate|lift_gate|bollard, amenity=bank|place_of_worship. I also think it is better to have more colorful icons instead of all shops purple. But I think we can replace some awful JOSM icons (like for optician). Also replacing some png by svg is a good thing. Maybe I'll add my rationale for this change. Presonally (and I know it's not only my opinion) I prefer unification of icons because it's easier to find in menu and also on map. Frankly, sometimes it's hard to guess what is depicted on current JSOM icons - icons for osm.org are definitely better designed. Edit: most of the icons (all in this change) are SVG so different color for every menu is definitely possible). Not so related with this ticket, but the butcher icon is missing in JOSM? Another thing is, that you often use aerial imagery background in JOSM and you need colorful icons to see them. Icons with only one color are often hard to see. So we would atleast need a white background for these icons. Yes, but the important part is "where the blue part does not touch the border of the icon"
OK guys, tomorrow there is a bank holiday in Poland, so I'll be offline until end of week. You can wait or close this issue. I'll deliver icons next week. I created Osmic and most of the new icons in osm-carto. To customise the icons from Osmic you can use a script, it is possible to add shields, rounded corners, re-colour, adjust padding, re-size etc. Have a look at ​https://github.com/nebulon42/osmic/blob/master/tools/export.md. I'm happy to help, just let me know what you need. If you need different parameters or the icons in different form let me know. Thanks nebulon, here's how they look like on map. I used shield icons for map and icons with transparent backgroud for menu. Looks fine to me. Having all icons in the same (black/grey) colour would also be an option (better contrast on the map). @Klumbumbus: What is the status? I will replace some icons when I have some time. Probably tomorrow. leave as closed The owner will remain Yarl.